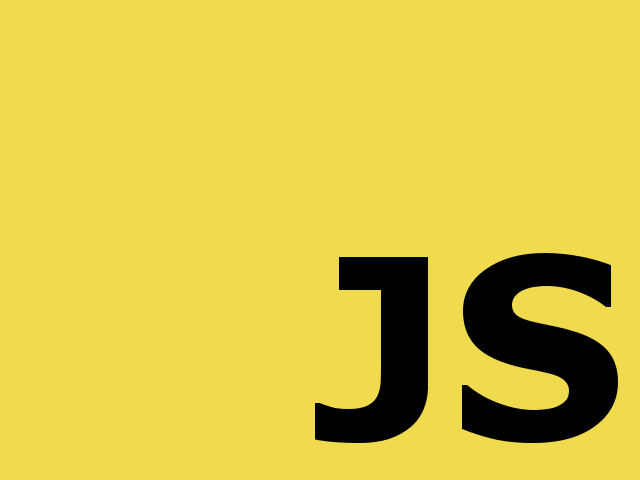 jQuery provides support for asynchronous server interactions using Ajax API. 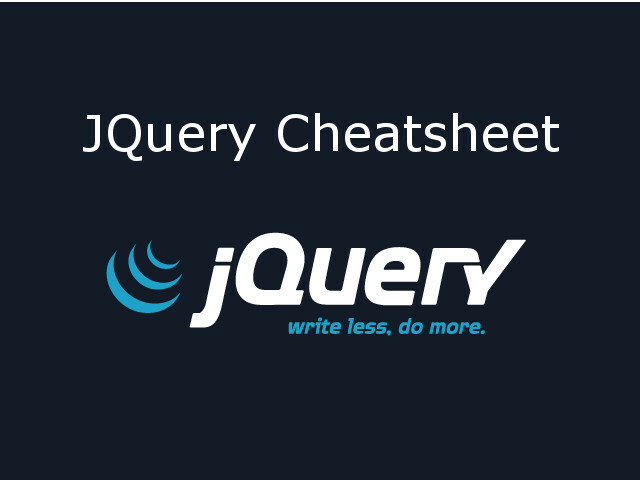 jQuery Ajax is very easy to use and provides different methods as per need to quickly make AJAX calls to server. One can customize AJAX call to server using this method. A sample code snippet for AJAX call is as below. //async default is true. Request should be async or not. // beforeSend is mostly used to apply AJAX request settings. //Operations to perform before sending ajax request. return true; // Return false will cancel the ajax request. 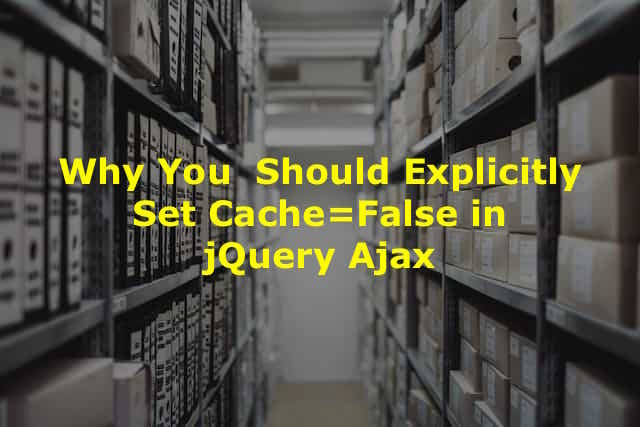 //cache defines ajax request needs to be cached in browser or not. // contentType Defines content type of data which is being sent to the server. // This is the content type server method is expecting to process data. //crossDomain Set to true if you are making ajax request to another domain. //data value can be key-value pairs or querystring. //dataFilter is data pre-processing function. // This function executes upon successful response from the server. // This function can preprocess responseData and then success callback will execute. //dataType is the response Data Type. // Default is intelligent guess to XML, JSON, Script or HTML. Datatype will try to parse the response data as defined in dataType and if parsing fails then it will trigge error. // statusCode method executes if specific status code is returned in the response. // textStatus can be null, "timeout", "error", "abort", and "parsererror"
// When an HTTP error occurs, errorThrown receives the textual portion of the HTTP status, such as "Not Found" or "Internal Server Error." // statusText can be "success", "notmodified", "nocontent", "error", "timeout", "abort", or "parsererror"
Above format is underlying structure of all different variants of jQuery Ajax methods. Above format is used to send customized ajax request to the server. 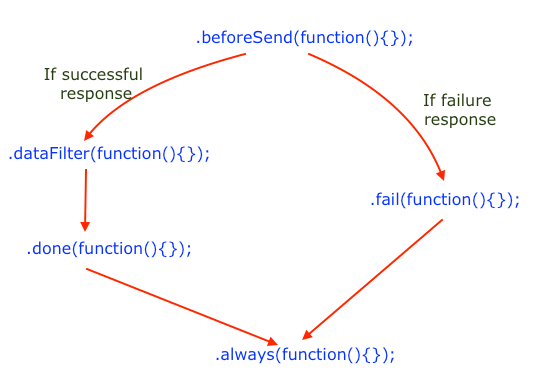 Below image shows the execution of jQuery ajax callback functions execution order. $.ajaxSetup() is used to setup default Ajax settings to be used for all future requests. cache: false // This will not cache any Ajax request's response from server. 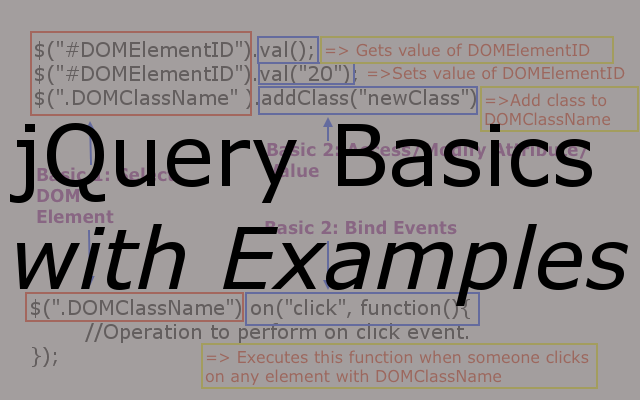 jQuery provides methods to perform common operations without writing too much code. // second success call back function. // Above line will load test.html and find DOM element with ID = container. //This element along with its inner content is inserted into the element with ID = result of a document. Global AJAX event handlers are used to specifies settings to be applied on all ajax requests. global: false is used in $.ajax request to avoid call to global ajax event handlers.